Roca Restaurant / Gee Whiskers! I don't really ever do reviews of restaurants because I don't consider myself to be a foodie. 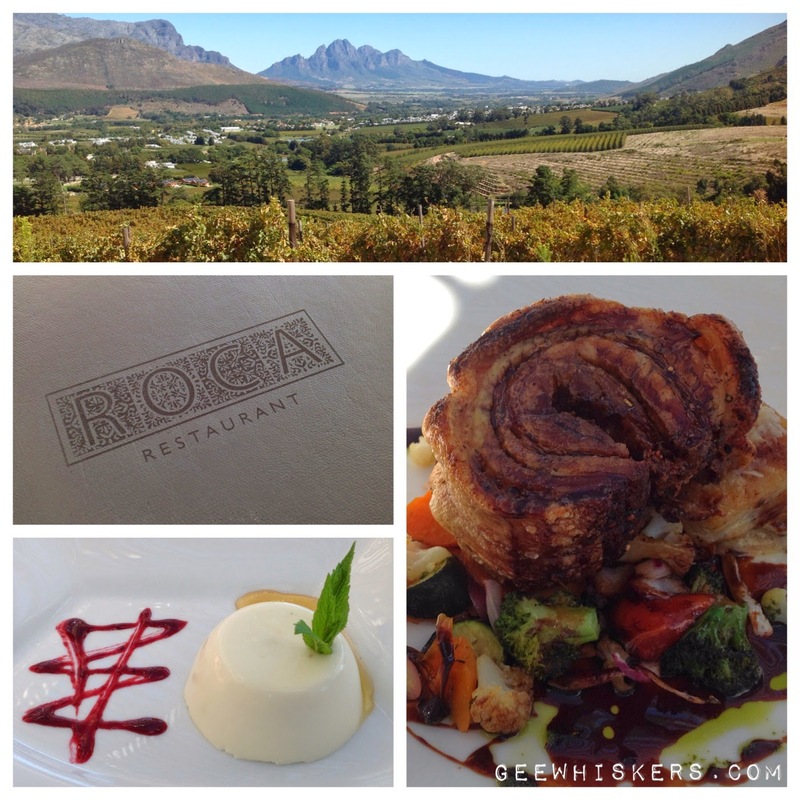 But on Sunday last week my fiancé and I went to Roca in Franschhoek for a lunch date and had such a fantastic meal, that I just had to share some information about the place. You can find Roca at the end of Uitkyk Road as it is the resident restaurant for Duie Donne Vineyards. Roca is a Mediterranean restaurant that has a wide and varied menu consisting of tapas, seafood, poultry, meat, pizzas and pasta. The dining area is designed to take advantage of their hillside location where one can take in the beautiful Franschhoek valley. The seating outside on the veranda seemed to be the seating area of choice for most people (that is where we were seated) but personally I think the views from inside the restaurant are somewhat better as you have slight more of an elevated view of the valley with no sun beating down on you (I am one that loves air-conditioned rooms when it is over 30 degrees outside). Everyone will find something on the menu that they will enjoy. For me that was the pork belly served with roasted veggies and a sweet thai sauce. The meal was truly so delicious and well worth the R150. I ended my meal with a panacotta served with berry sauce and honey (R60). I definitely will go back to the restaurant, for a special occasion, as the prices are quite steep. 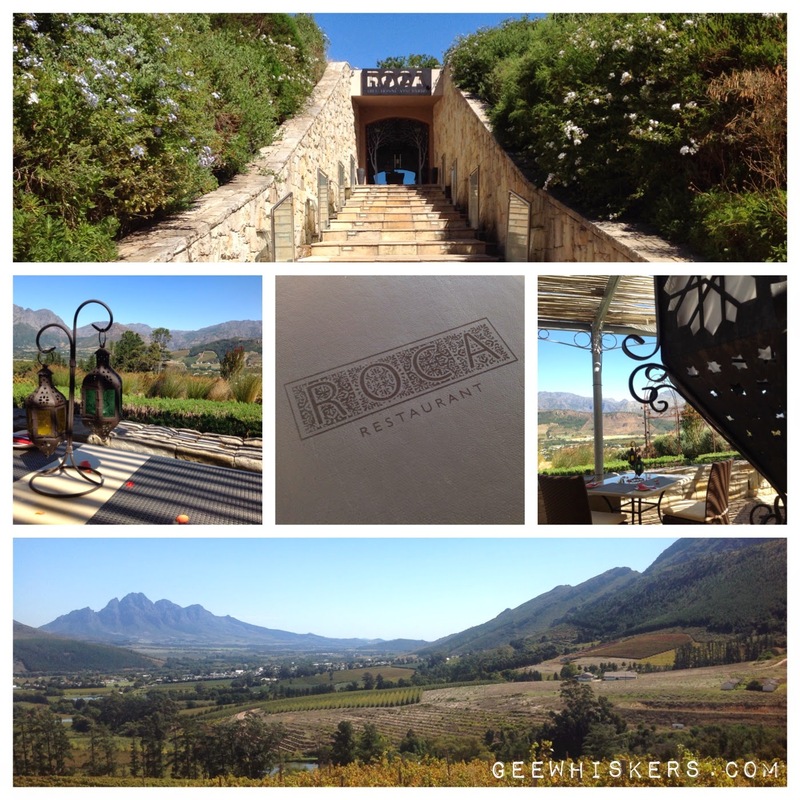 The drive to Franschhoek is a beautiful one so a trip out that way is always well worth it. Have a wonderful weeeknd everyone! PS. The menu on Roca's website is rather outdated however if you want to go for a visit the contact information is still the same. I NEED to move to Cape Town ASAP! I love Franschoek and cannot wait to visit again soon.